Posted Signs on a roll with your CUSTOM information by Minuteman x250 by Minuteman Signs at Freedom from Government. MPN: 101VO. Hurry! Limited time offer. Offer valid only while supplies last. Our Tyvek signs are flexible aiding in application to uneven surfaces and 12″ x 12″. Within the legal requirements for signage for most states. 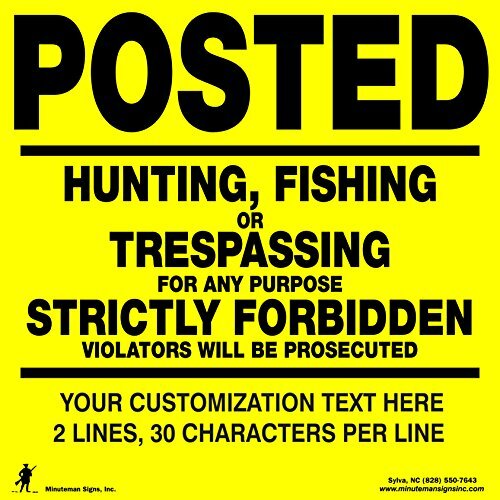 View More In Hunting Signs. Our Tyvek signs are flexible aiding in application to uneven surfaces and 12″ x 12″. Within the legal requirements for signage for most states. Highly visible due to color contrast Printed in waterproof ink UV Treated and highly resistant to fading. Easily stored and carried because these posted signs are provided on a perforated roll. Can be personalized with your name, address, and/or organization name, etc. CUSTOMIZABLE! Add YOUR INFORMATION to the bottom of the sign! If you have any questions about this product by Minuteman Signs, contact us by completing and submitting the form below. If you are looking for a specif part number, please include it with your message.